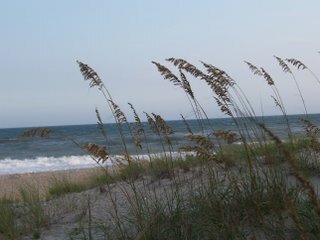 I’m back after a pleasant few days at the beach in North Carolina – a trip that was a happy combination of idleness and activity. I’m toasted a very light brown due to the judicious application of sunscreen and much hat-wearing, I have the requisite amount of sand in my shoes, and I got my eyes, ears and nose full of beach sights, sounds and smells. I headed south at the crack of dawn on Sunday. Since I was by myself, the drive was a good opportunity to listen to lots of music from the 1940s and have some creative thinking time. I stopped for gas and lunch south of Rocky Mount, and got into Emerald Isle about 3 PM. The beach house, which is owned by my sister Margaret’s friend Sue, is situated on the sound side of the barrier island known as the Crystal Coast. However, it’s a really narrow part of the island, so you can walk from the sound side to the ocean side in less than five minutes. 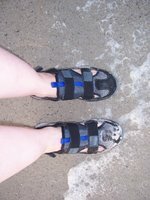 I got the car unpacked in quick time, then put on shorts and my spanking-new beach shoes, and walked down to the shore. I’m happy to report that my L.L. Bean beach shoes performed well. They gave me plenty of support and, beyond some baby-toe blister action on the first day, were pretty comfortable. Of course, no shoe is comfortable when it’s full of sand, but all in all they were a good investment. Since I felt kind of kinked up after eight hours in the car, I struck off at a brisk walk along the surf line. My landmark is a water tower that looms over the beach access path nearest the house; before I knew it, the water tower was well in the distance and I had walked out of Emerald Isle into Indian Beach, which is the next town north. Since the sun was starting to set, I decided I’d better double back. Round-trip, it was roughly a two-mile walk and the perfect antidote for sitting in the car all day. 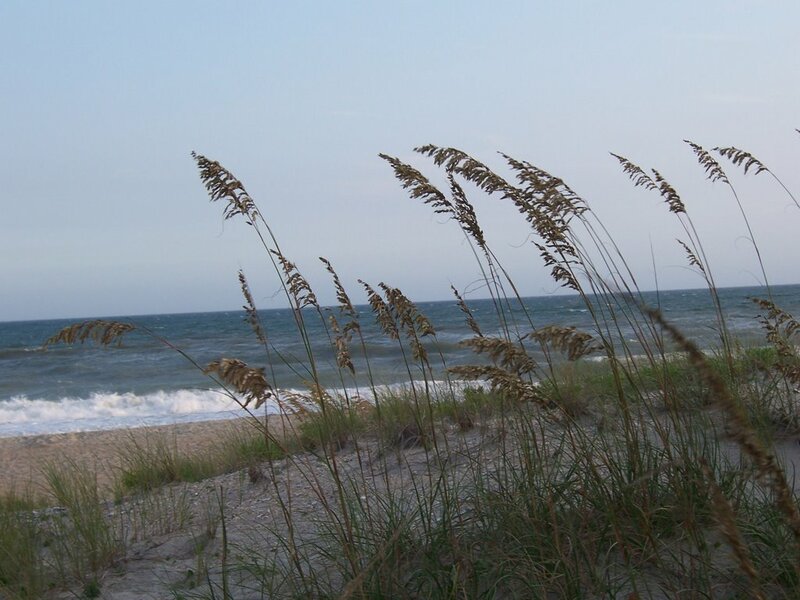 The nature of a barrier island is that it shifts and moves according to the weather and waves. This, of course, isn’t good for the people who build homes and businesses on barrier islands, particularly those who cater to the tourist trade. They refer to this natural movement of sand and shore as “erosion.” Periodically, the town fathers arrange for sand dredged from somewhere off the coast to be deposited on the beaches to build them up. This makes for a somewhat gray and shelly beach – and sometimes, a smelly beach. Because the dredged material is full of dead and dying organic matter, and because dumping it on an existing beach effectively smothers the pre-existing sealife at the water’s edge, there’s a definite downside to this practice, particularly if you’re a shore bird. 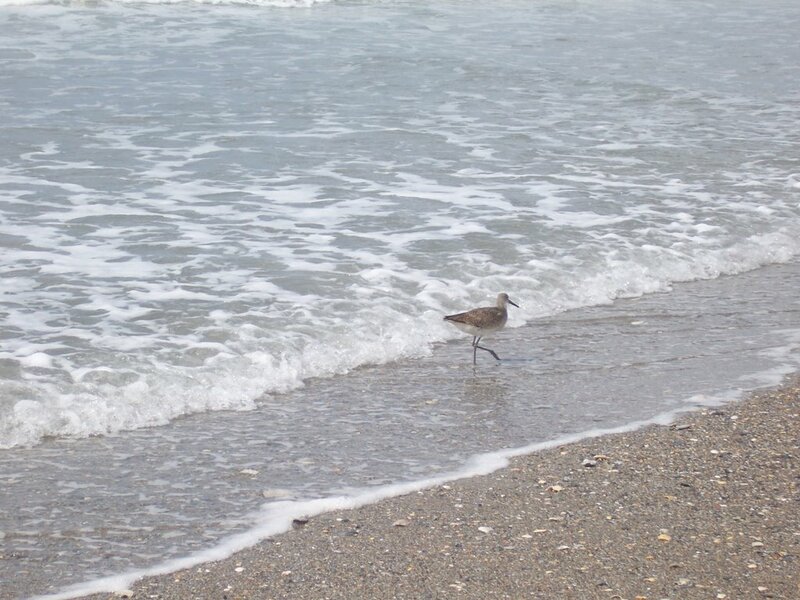 For example, the willets and other shore birds frequently feed on coquina, those colorful little butterfly-shaped mollusks that you see burrowing into the sand as the waves wash back into the sea. On this visit, I didn’t see any live coquina colonies – just the occasional empty shell. I also didn’t see many mole crabs, which are another major food source for shore birds. In fact, I didn’t see as many shore birds as I normally do – just a few willets, the sanderlings, a ruddy turnstone or two and some dunlin. There definitely weren’t as many gulls. I’m not sure where I fall on this issue, which is a very hot topic for those whose livelihoods revolve around the beach. 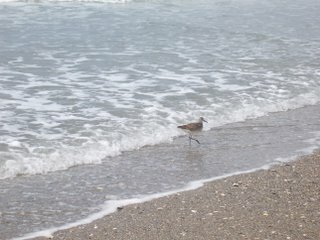 I sympathize with the property owners, but what good is a beach without its wildlife? I also realize that, as a visitor who wants to stay on the beach and have conveniences such as restaurants, shops and groceries nearby, I’m part of the problem. I mulled the situation over as darkness fell and I walked back to the beach house. I dined on some leftover chicken I’d brought from home, read a large chunk of “Great Hurricane of 1938” and watched some television. Around midnight, I went to bed, and fell asleep to dream of dredging and birds. Ah what a perfect first day! I feel as if I walked along side you. Reminds me of “Footsteps in the Sand”. I love that the little millet kept ahead of you. He must have enjoyed your company.